The major driver was that the Fertile Crescent contained seed crops and animals (sheep, goats, cattle, pigs, and horses) that lent themselves to successful domestication. This domestication then spread roughly along the same parallel east to Asia and west to Europe. Domestication didn’t spread in the America’s and Africa’s due to their north-south orientation. Advances quickly moved back and forth between east and west, but climatic zone differences inhibit flows north and south. This resulted in massive food production in Eurasia. Food production, in turn, led to stationary populations and excess food that supported artists, bureaucrats and soldiers and sophisticated technologies (guns and steel). Population density along with close contact with animals, led to germs affecting large numbers of people. As infectious diseases killed large numbers, the surviviors developed immunity to them. The black death is a good example. Anywhere from 30% to 60% of the total population in Europe died. The population did rebound over time. In the Americans, disease killed 95% of the Native American population, which was estimated at 20,000,000 decimated in 1492. Germs didn’t have the same impact in Africa as it wasn’t isolated from Eurasia and so had been affected my the same diseases. 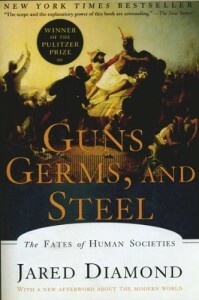 Technology advantages, plus immunity to most germs, allowed Eurasians to easily subdue the natives of the Americas, Australia and Southeast Asia. At the end of book Diamond addresses why Europe instead of the Fertile Crescent or China end up on top during the last 500 years. For the Fertile Crescent he states that it is due to resource depletion. For China Diamond claims it is because there were no geographic barriers in that part of the world so China was unified politically – so a decision made centrally affected all of China. In Europe the opposite was the case. There are so many geographic barriers that Europe was not unified politically. China was ahead of Europe in almost every area in the 1400s. They had massive fleets with ships orders of magnitude bigger than Europe had at the time exploring under the command of Zheng He from 1405 to 1433. However, when the faction that support the fleets fell out of favor, the exploration were abandoned and the information about the fleets suppressed and China turned inward. In Europe. Columbus was able to go from court to court until he found backing for his voyage. My personal opinion is that this doesn’t fully explain the China vs Europe issue and that there were more factors involved. I highly recommend this book as it does shed light on how the world got the way it is.